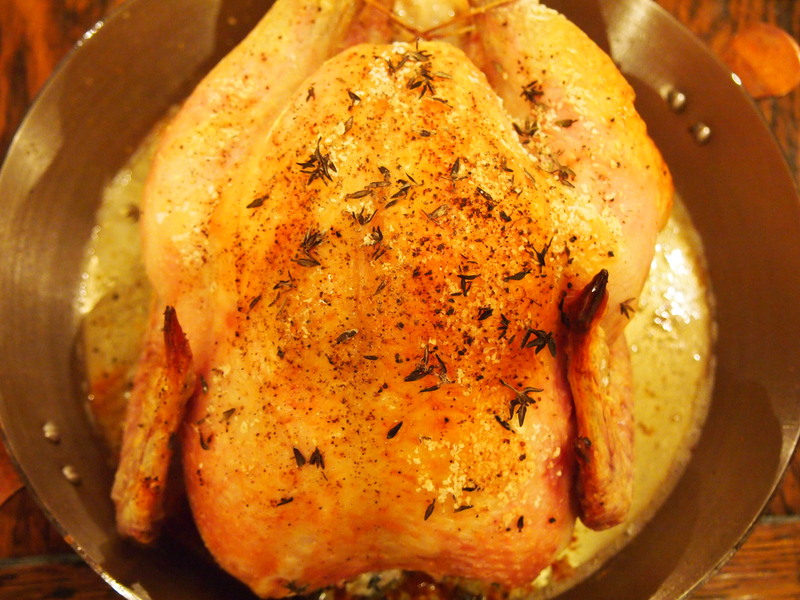 There are as many recipes for roast chicken as there are chefs and to try to find the perfect recipe is as elusive as finding the recipe for the perfect chocolate cake or perfect roast potatoes. There are lots of good ones out there, but are they perfect? Well this is one instance where I think the search has come to an end. Thomas Keller needs no introduction. His string of Michelin starred restaurants are consistently featured in the top 50 restaurants of the world and his flagship, The French Laundry (in Napa) has been on the list for 10 years. This recipe which he says came about from cooking large quantities of food for staff dinners is perfect not only for it’s sublime taste but for the mind boggling simplicity. There’s no basting, there’s no stuffing (not even a lemon! ), there are no garnishes and surprisingly no oil or butter used. 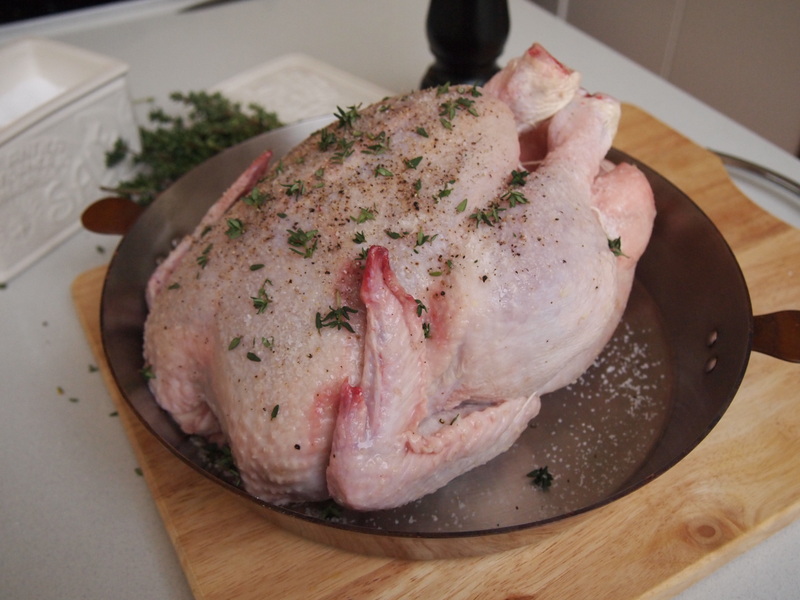 The only ingredients are chicken, salt, pepper and some thyme leaves. That’s it! It’s roasted at a high temperature for 45 – 50 minutes and not touched at all during that time. Butter/oil is not used as Keller believes this produces steam and hinders the skin crisping. The most time consuming part of the process, and I’m talking 10 minutes tops, is removing the wishbone (to facilitate carving) and trussing the chicken. Click here to see a video of chef Keller prepare this dish. The only other stipulations are that the chicken be at room temperature, completely dry and the oven pre heated. 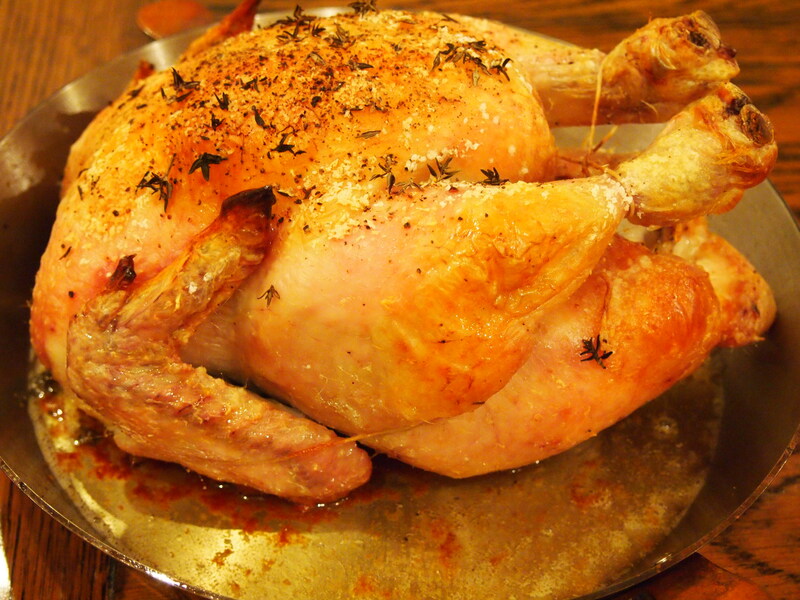 I used a 2kg chicken (organic – the quality of the chicken is important here) and cooked it at 225C for 50 minutes then let it rest for 10 minutes. Perfect. Tried this out Saturday night when a friend came over. It was as you say simple and delicious. I had a chicken of about 1.5 kg and cooked it for 50min but it wasn’t long enough. I’ve been caught like this before so I must remember to give chicken longer in my oven. It’s a really pain when you’re ready to go to the table only to find the chook needs a bit more. None the less the chicken was great and the leftovers made for a great salad the next day too. Hi K, Thanks for the comment! It is a pain when things take longer to cook than you expect. Maybe your oven runs a little on the cool side, or maybe mine runs hot? I had a larger chicken than yours and mine cooked in 50 minutes. Glad that you thought it tasted good though.